Caoinkeen was our first stop on a 5-top (2 car) trek that took in Caoinkeen - Knocknamanagh-Knocknamanagh NE - Gullaba Hil l- Bird Hill. There is just room to pull over to the side of the road beside a short track at 027 685 A (our finishing point). We then drove south along the narrow road and parked at point 023 657 B, and began our walk up a track (that leads up to Lough Akinkeen) for a few hundred metres before turning south and heading up the steepish incline that runs to the east of Caoinkeen. 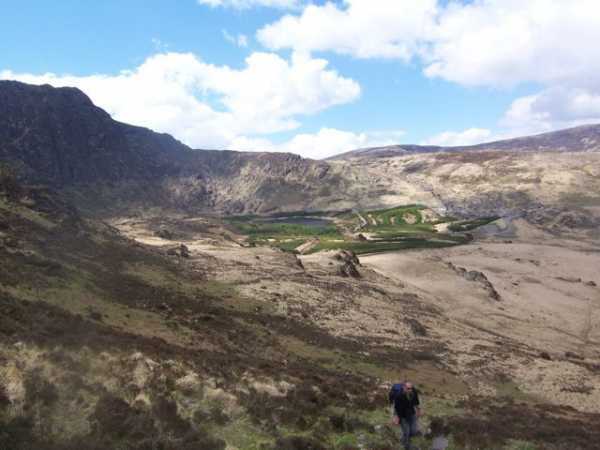 The route offered great views of the valley and the steep cliff that encloses the lough on three sides (see pic). Caoinkeen itself is a broad, rocky top marked by a cairn. About an hour and a quarter to the top.